12 Golden Semplers and the Grand Sempler were awarded at the 16th Sempler Awards Show. This year, the Semplers went to as many as 5 countries in the Adriatic region; besides Slovenia, also in Croatia, Serbia, Bosnia and Herzegovina and Montenegro. 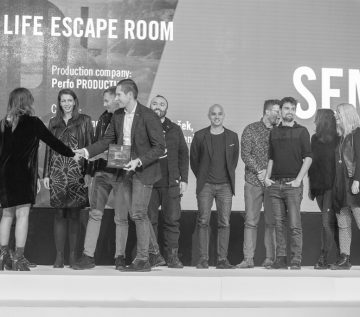 The Grand Sempler for the best media strategy in the Adriatic region went to Agencija 101 and UNICEF Slovenia for “The Real Life Escape Room”. More than 90 entries were submitted to this year’s Sempler Awards Competition for the best media strategy of the year in the Adriatic region of which 44 were shortlisted. The nine-member international jury selected 12 media projects among them, and awarded them with the Golden Sempler Award, and the Grand Sempler, the highest award of the competition. The Grand Sempler went to “The Real Life Escape Room” project, created by Agencija 101 for UNICEF Slovenia. This year, the Sempler Awards went to as many as 5 countries from the region; besides Slovenia, Croatia, Serbia, Bosnia and Herzegovina and Montenegro were also awarded. How to escape from the escape room? The aim of the winning campaign “The Real Life Escape Room” was to raise public awareness about the worrying high rate of child sexual abuse in Slovenia, to change the wrong beliefs about the issue and to point out the only real step towards the solution, that is, an immediate call for professional help and protection of the child. In a secret location, in the actual place of sexual abuse for several years, a pop-up escape room was opened for two days. The selected groups of visitors that registered via the website accepted Amadea as their host. She told them the story of a playful little girl whose grandfather took away her best time of life because she had sexually abused her for several years. And even though visitors did not know it at the time, this little girl was Amadea. The visitors’ task was to find a solution for all the children who are caught in similar situations at that moment. The only clue led them to call and report abuse to the Association Against Sexual Abuse. According to the Sempler Awards Jury President Zdenka Milanović, Cluster Marketing Manager for Local Spirits at Coca-Cola Hellenic, Serbia, the jury members were fairly in line in choosing the best media campaigns. “When we agreed about the key criteria that we followed, our work went on smoothly. We rewarded the campaigns that were carried out professionally and used the media and communication channels in an innovative and creative way. 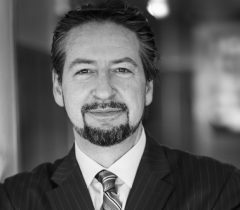 Above all, we wanted to highlight those media projects that had a significant and far-reaching impact on their target group or even on society as a whole,” Milanović pointed out. “The Real-Life Escape Room” met all of the above criteria as in the first 10 days of the campaign the number of reports of sexual abuse of children increased by 20%, while media posts reached 66.4% of Slovenians between 15 and 70 years. In addition to the Grand Sempler, Agencija 101 also received the Golden Sempler in the category best technology approach for the Volkswagen’s project “Run for your light” at this year’s Ljubljana Marathon. In collaboration with engineers, they developed an e-runway that formed electricity with the power of runners. The highest number of Golden Semplers, as much as 3, received the Slovenian agency Luna\TBWA – in the category best PR strategy or promotion for the campaign “Heroes drive in pajamas” created for Zavod Vozim, in the category strategic use of media mix for “Laško Challenge” for the client Union Laško Brewery, and in the category best use of data or research initiative for “Buy, Robot!” created for Lidl Slovenia. Among the Slovenian agencies, the Futura DDB was also awarded with the Golden Sempler for the project “The Cleanest Font in the World” by Ecologists Without Borders, in the category best new media/media format. Another Slovenian entrant was awarded, namely the Slovenian Tourist Board, which received the Golden Sempler for the best social media campaign; that is “Two Million Reasons Why We Feel Slovenia”. In this year’s new category best use of influencer marketing the Golden Sempler was won by the Serbian agency Ovation BBDO for the Nectar’s campaign “For 20 years, it does matter!” In the category innovative use of the communication channel, gold was awarded to the campaign #Unwanted, created by McCann Podgorica and McCann Belgrade for the NGO Center for Women’s Rights in Montenegro. In the category best targeted campaign, the Golden Sempler went to “Part of the Game” created by MITA Group Sarajevo for the Lottery of Bosnia and Herzegovina. The Golden Sempler for the best experiential campaign was given to “Paint it back” campaign, created by Imago Ogilvy from Croatia for Scouts of Croatia, and in the category best use of digital world, the jury chose the campaign “Catch the Goldfish”, created by Communis DDB from Serbia for Bambi. In the category best use of mobile, the Golden Sempler was awarded to the Croatian agency Infinum for the Sandoz project “Terappia”. At the Sempler Awards Show after the first day of the 20th Media Trends Conference SEMPL two special TOP SEMPL Awards were also given. Award for The Media Manager 2018 went to Gregor Memedović, CEO of Next Media Group, while Miha Raušl, creative content strategist at PM, poslovni mediji, received the Future Media Star 2018 Award.